When Ain’t Misbehavin’ opened on Broadway, it made history by winning every Tony Award, including Best Musical. Reviewer Clive Barnes predicted Ain’t Misbehavin’ would be “a joyous celebration that is going to cross the world.” Well, that time is now, with an exciting new production of this award-winning musical. 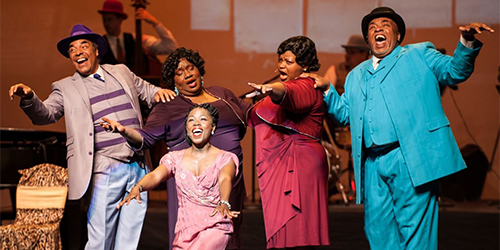 Ain’t Misbehavin’ encompasses 30 show-stopping musical numbers that take you on a journey not only through the Fats Waller songbook but through Harlem in its heyday. With snazzy period costumes, complete with bowlers and spats and ermine and pearls, the dynamic five-member cast turns the theatre into a rollicking rent party. You don’t have to be a jazz buff to enjoy Ain’t Misbehavin’. Like Fats Waller himself, you just have to love a good time. The cast brings audience members onto the stage to dance, sing, and have a good time. This fast-paced romp takes you where the high-steppers partied, from honky-tonk dives to the Cotton Club, from Tin Pan Alley to The Waldorf. It’s a night of entertainment you won’t soon forget.